With its 12 September release date creeping ever closer, a 30-second preview clip of every song from Metallica's new album Death Magnetic has now been posted online. Last week, MusicRadar was one of the very first sites on the planet to post a full track-by-track review of Death Magnetic, and if that has whetted your appetite then be sure to check out the crunching riffs from every song here on YouTube. It seems that any attempt to escape from the Death Magnetic PR machine is impossible at the moment; after catching up on the weekend's football highlights we stumbled over this documentary about Metallica on BBC2's The Culture Show. To quote the show's host, "Nothing it seems quickens the pulse like the prospect of a good thrash." 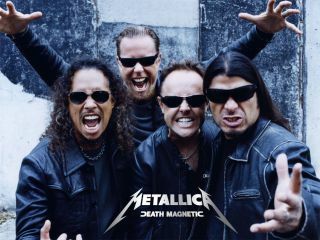 On the evidence of what we've heard, Death Magnetic promises to be the most thrash-tastic Metallica record in years.